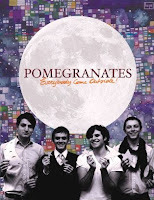 The Pomegranates will play a CD release show tonight at The Southgate House in Newport, KY with Headlights, Matthew Shelton's Picnic and Enlou. Their sophomore album, "Everybody Come Outside!" will be for sale at the show and is available now digitally at iTunes and eMusic or can be ordered from the Lujo Records store now in a variety of packaged deals here: www.merchline.com/lujorecords/. Also, www.buzzgrinder.com will be hosting an Online Listening Party tonight, streaming the new album between 7-10 PM. So, if you can't make it to the show at least give the album a spin tonight with Buzzgrinder! Look for a live review of tonight's show and the new album, "Everybody Come Outside" on Atlas and the Anchor soon! Cursive - "Mama, I'm Swollen"
Bell X1 - "Blue Lights On The Runway"
The Whip - "X Marks Destination"
Here We Go Magic - "Self-Titled"